I suppose there’s the BeeGees but otherwise you would be hard pressed to find three brothers happy to work together in a business who can also bring complementary skills to the table. The three Gladwin brothers clearly manage to make it work. 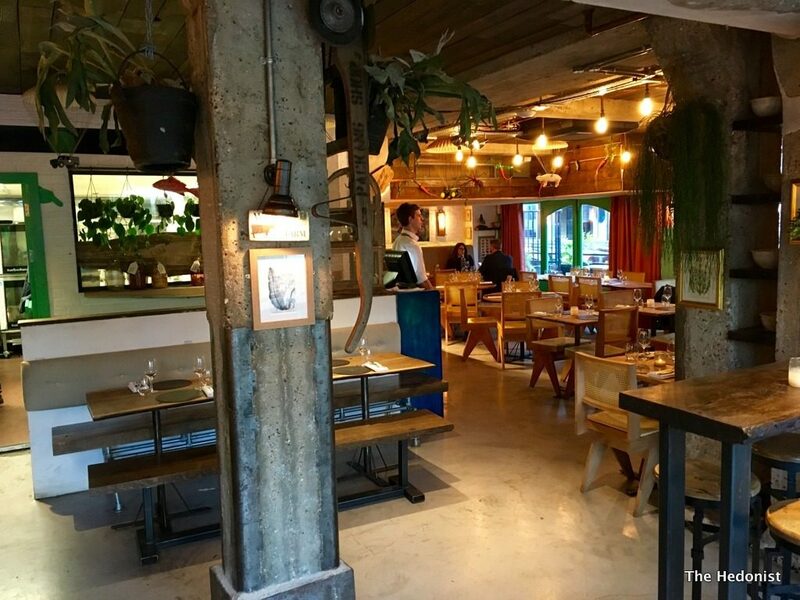 As well as their family farm and the eponymous vineyard in West Sussex they now have three restaurants in London; as well as Nutbourne (where we have been invited to review) there is Rabbit in the King’s Rd celebrating sustainable British ‘wild food’ and Notting Hill’s The Shed which is all about small plates of foraged food. One brother is a butcher and does the ingredient sourcing, the second is a chef and the third sings really high…looks after the front of house operation. 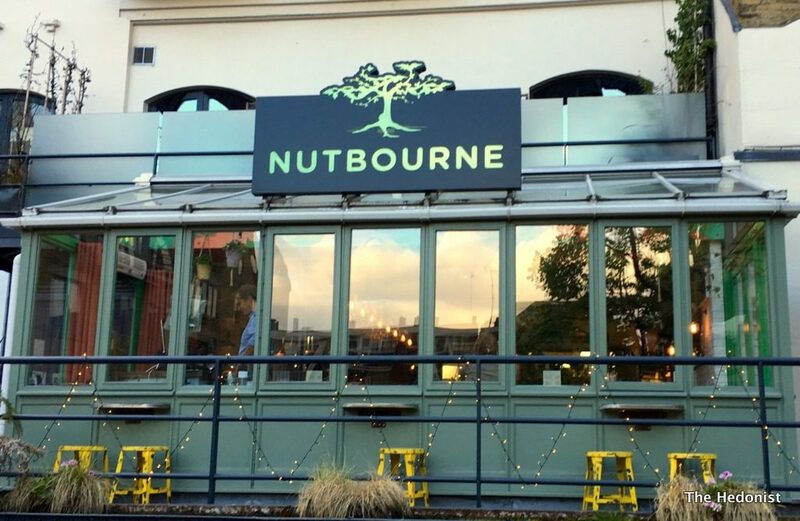 Nutbourne is in that bit of Battersea with little to offer in the way of public transport so I drive and am able to park in one of their off-road spaces. With the upcoming tube extension this will all change as the area becomes accessible to the hoi-polloi. As Fiona and I ponder the menu we fortify ourselves with a crisp appley glass of Nutbourne Vineyard. Nutty Brut 2013 (£11.50). 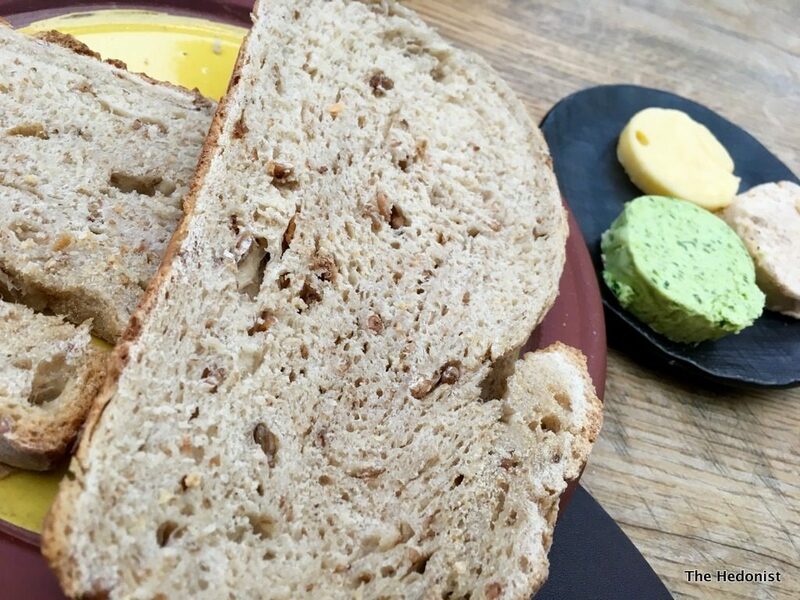 Some bread turned up but it was really just the vehicle to showcase a trio of butters, crab, smoked and locally foraged wild garlic that impressed with their broad-brush flavours. Next up was an amuse-bouche. The mushroom marmite pastry was a revelation. 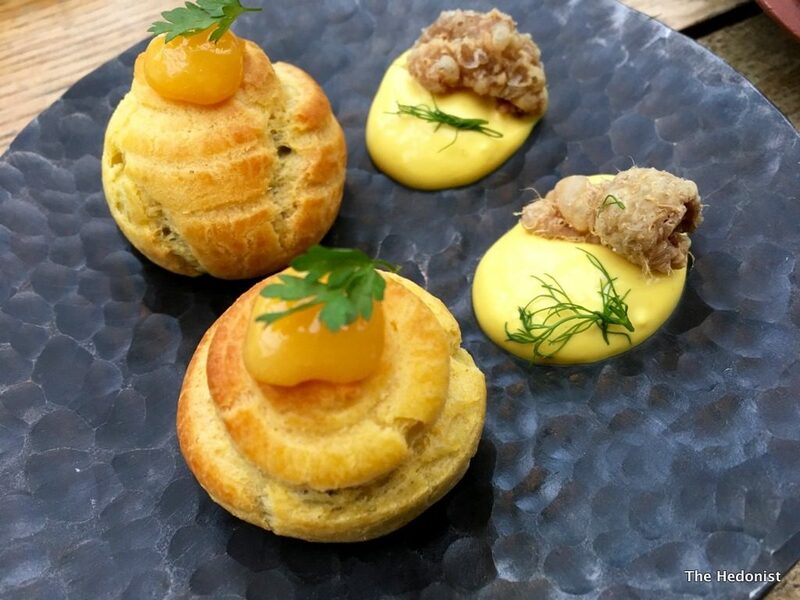 Bursting out of the delicate chou pastry was an umami flavour explosion with the impact of an Anthony Joshua uppercut. Crispy chicken skin was also intense with a slick of rich saffron aioli for extra impact. Cured Chalk Stream trout, garden peas, cow’s curd, smoked rapeseed oil, pea shoots (£10.50) was a perfect spring dish. 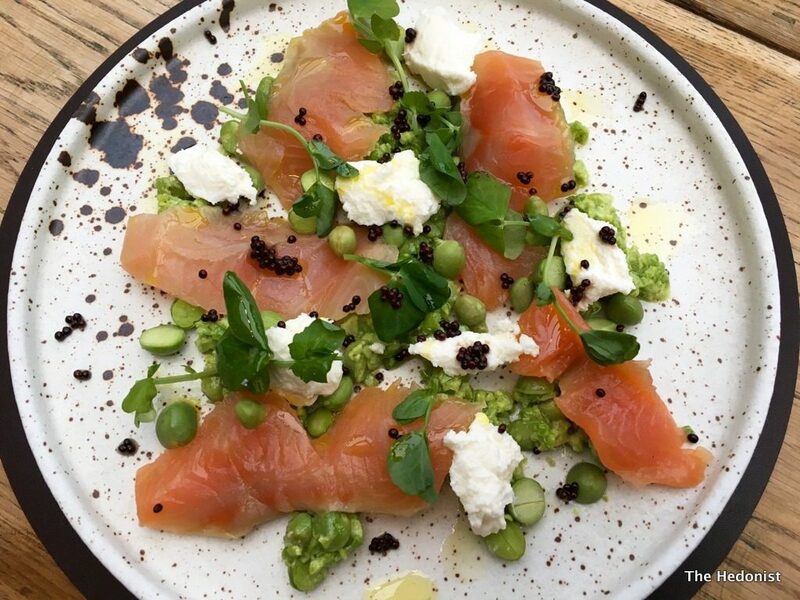 The trout was top quality – firm-textured and grease free with sweet crunchy peas and the curd adding textural contrast. Fiona was sticking to the fizz but since I was driving I moved onto a Seedlip (the world’s first distilled non-alcoholic spirit) and tonic . I often drink tonic with a drop of angostura bitters and this was similar but less bitter and a touch sweeter. However it did feel like a proper drink unlike most ‘mocktails’. 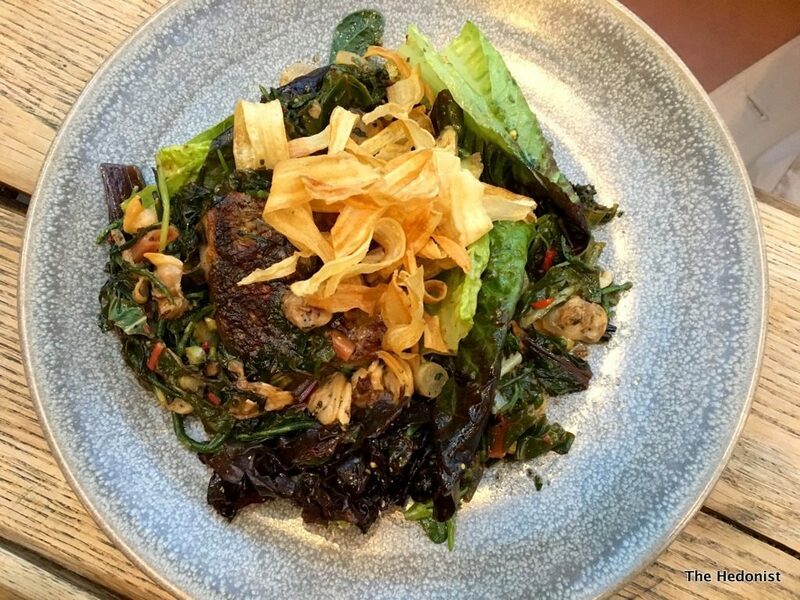 The mains may not have have been delicate assemblages featuring a clinically sous-vided piece of protein, but were all the better for the serious application of flame to flesh. 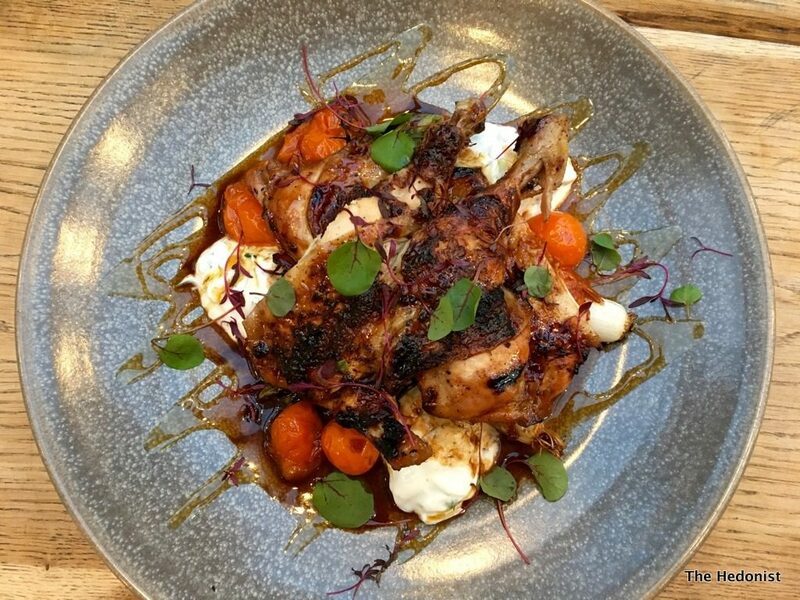 Fiona’s Spatchcock baby chicken, grilled spring onions, cherry tomatoes, cucumber yoghurt (£16) was a fusion of traditional English with Levantine influences which she described as being full of flavour – ‘dirty’ food but in a good way! Roasted cod, salsify, sea herbs, clams, lemon vinaigrette, nasturtium (£17.50) had a great mix of textures but was a little over-salted for me. I love the cod/clam combo and the way the dish layered flavours. 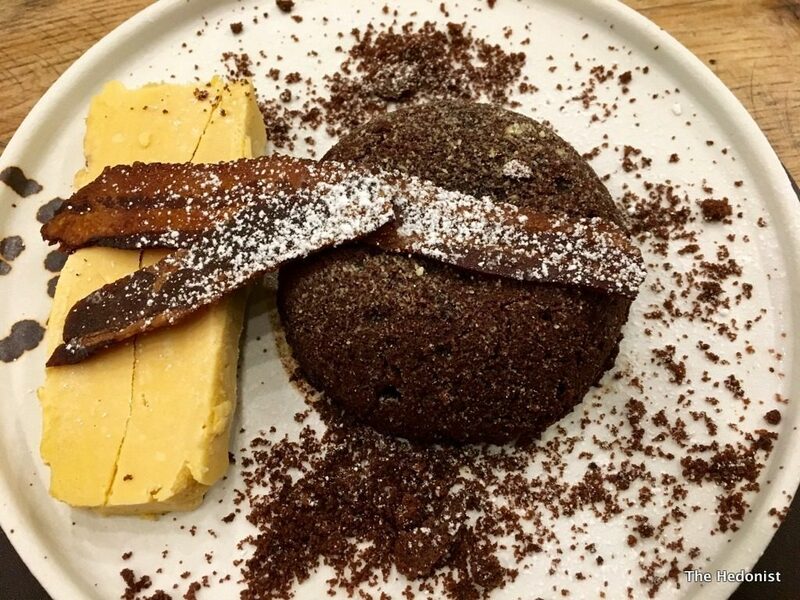 Fiona’s hot chocolate fondant, peanut butter ice cream, candied bacon (£6) was slightly lacking in the ‘ooze’ factor but a luscious glass of Lustau Pedro Ximenez (£6) added the necessary sweet lubrication. 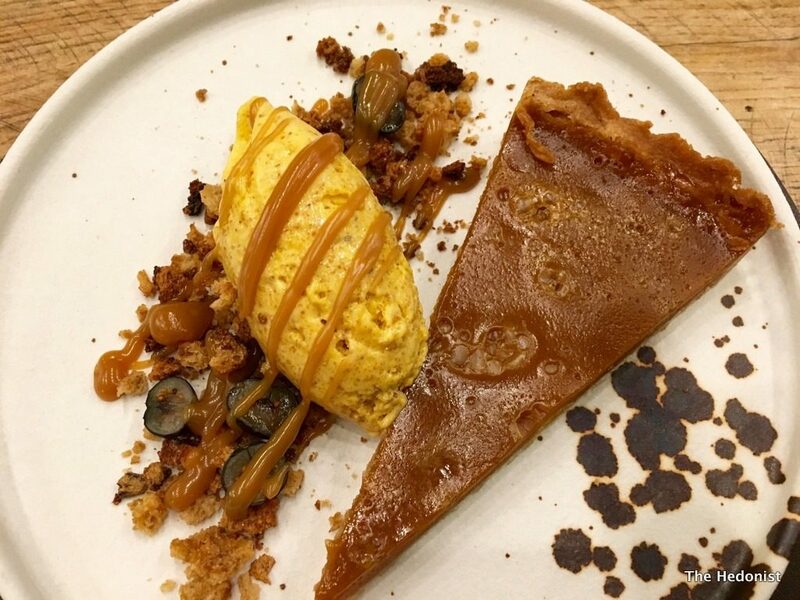 Salted caramel tart, brown bread ice cream (£6) is a dessert classic. Salted caramel is suffering from over-exposure at the mo but as part of a combo with the savoury ice cream created a fantastic pudding. 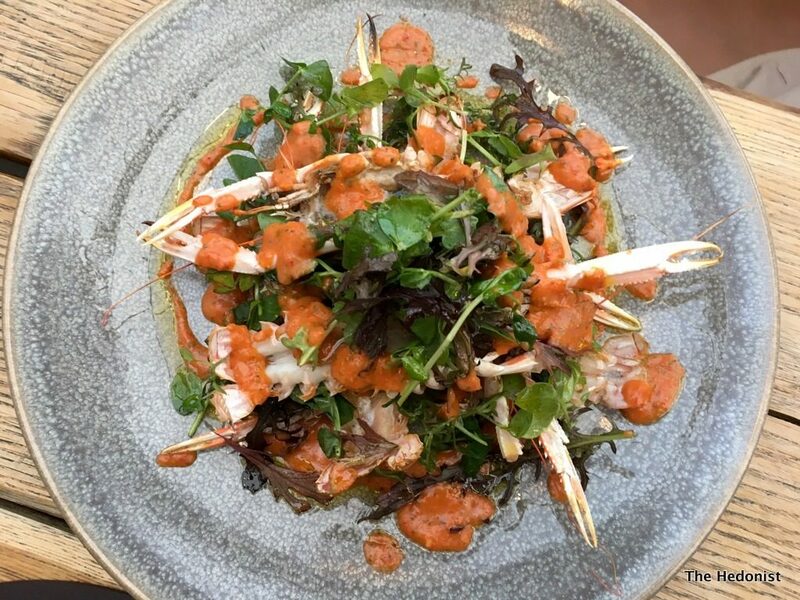 The Gladwin brothers (henceforth to be referred to as the GeeBees your honour) are doing something more profound than just creating a great neighbourhood restaurant with a lively atmosphere and friendly service. 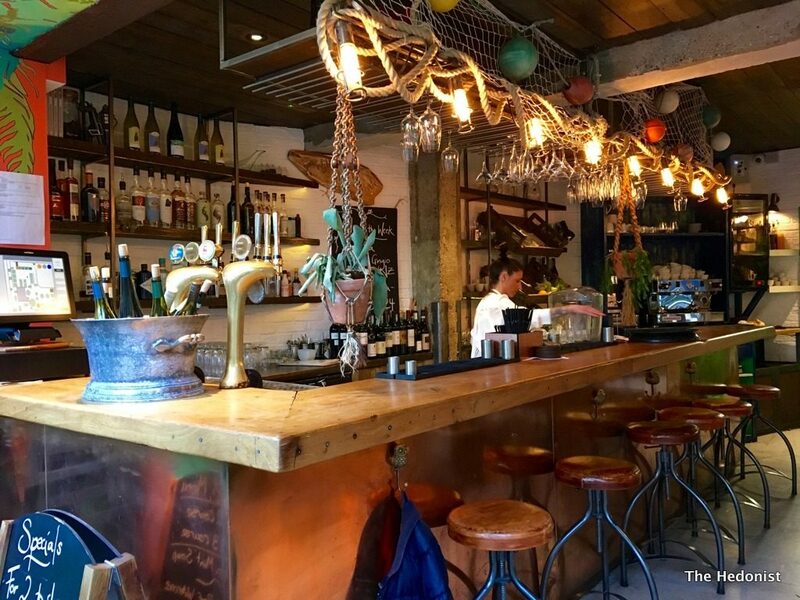 They are creating an ecosystem for a British rustic cuisine based on cleverly sourced produce, local wines and big bold flavours. We should support them.